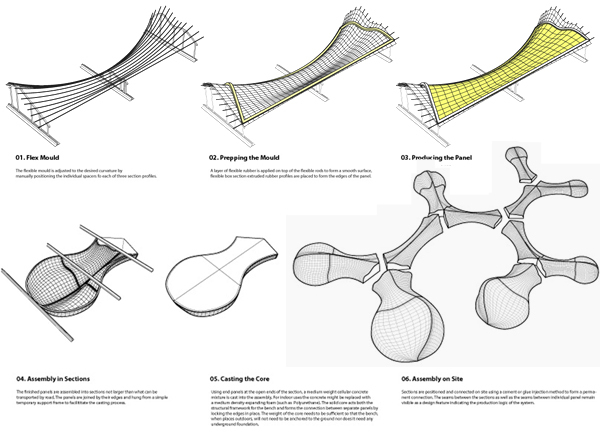 [FlexLounge] is a differentiated public seating system to be constructed using a single, adjustable mould. 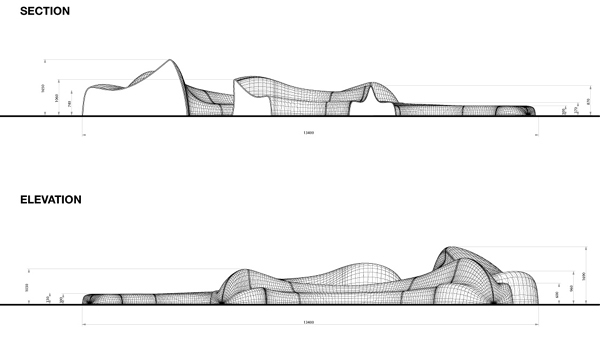 The design strategy offers a system that can generate formations responding to circulation patterns in public spaces. As a production strategy the design is conceived as a modular, component-based system that allows for variation within the components by using an adaptable mould. 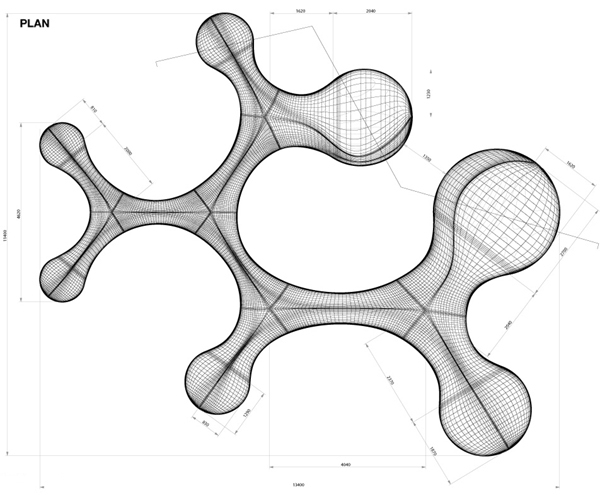 These design and production aspects overlap and reinforce eachother, synthesised in the concept of ‘Flex’: formal expression, performance and variation within the production method are based on the principle of variable curvature. 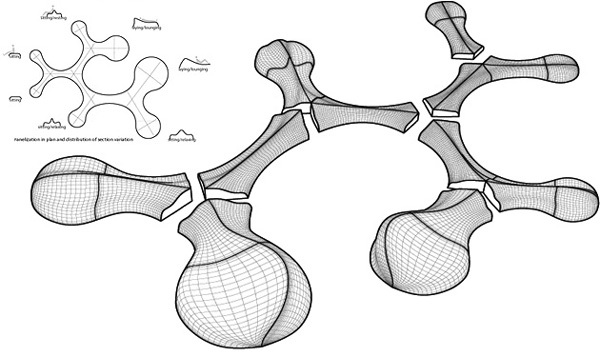 The design shown is just one of many possible outcomes of a generative design method. 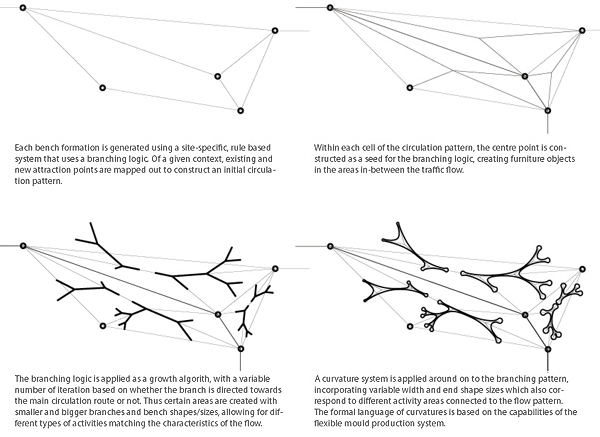 The system is based on a branching logic; offering public seating in arrangements that are very different then normal outdoor benches. The curvature in the bench formations allows usage by individuals as wel as groups of people, it stimulates social interaction. Variation within sizes and shapes allows for many different activities, both planned and unforeseen. The fabrication strategy of the Flex Lounge is based on a flexible mould system that can be adapted in the factory by hand. The design system is based on components which have a variable curvature in plan that is either convex or concave, controlled by a flexible curvature element and three control points. In section the design and uses 5-control point curves to enable surface generation with variable performativity: a stool can transform into a seat with variable backrest angles or into a lounge chaise. The mould system can be adapted manually and the panel fabrication method is based on existing technologies, such as the production of glassfibre reinforced polyester (GRP) hulls in the boatbuilding industry. The current design is based on small scale physical testing of the adaptable mould, the system could be further developed with relatively limited means as it is based on relatively low-tech hardware.